BLOWOUT SALE. PondCare BioFilter Booster is a highly concentrated solution of beneficial bacteria that start up and maintain the biological filter in water gardens and koi ponds. Goldfish and koi continuously release harmful ammonia into the pond. Uneaten fish food and decaying algae also cause ammonia and nitrite build-up. 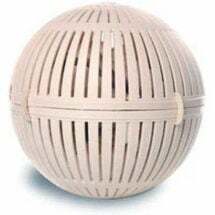 The beneficial bacteria in BioFilter Booster quickly establish the biological filter and begin breaking down these harmful substances and improving water quality. 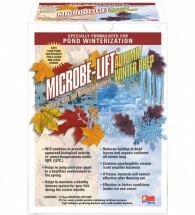 Regular use of BioFilter Booster helps the biological filter remain active all season long. 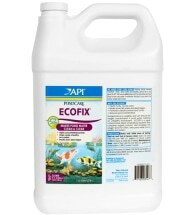 Reduces the buildup of toxic chemicals from fish waste, uneaten food and dead algae. Will NOT harm people, pets and wildlife. 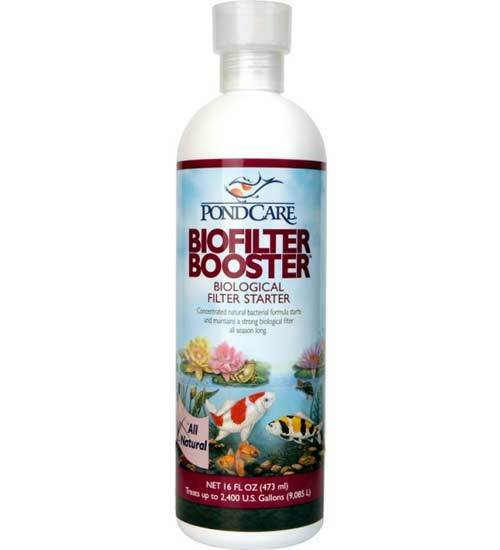 Spring Startup and New Ponds: Add 2 tsp for every 25 gallons of pond water directly into the biological filter once a week for 4 weeks, or until water tests for ammonia and nitrite remain at zero. Summer Directions: Add 1 tsp for every 25 gallons of pond water directly into the biological filter once a month. If water testing indicates dangerous levels of ammonia or nitrite, revert to “Spring Startup” directions while corrective measures are taken. 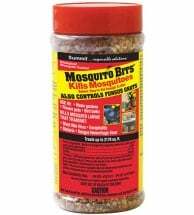 Bti-coated granules are very effective against mosquito and fungus gnat larvae. Breaks down algae and cleans water to create a healthy ecosystem for fish. Works to break down dead organic matter while you’re snuggled in by the fireplace!